Good question. Sometimes I wonder. I was born in North Carolina, grew up in New Jersey, and I’ve lived in Florida for most of my adult life. I just finished an outline for a science fiction novel that I feel fits together well and is believable if I can execute it properly. It’s a great feeling to finish a rough draft and have it come out better than expected. The bad news is I’ll have to do an ungodly amount of research. I started writing short stories in high school. I thought I was a genius destined to have a world-wide audience. That hasn’t worked out exactly the way I expected. It happened about five years into my career when I started to work in marketing. I noticed that writing was the only thing I liked about working. I quit my day job about ten years ago and I still like to write, but not when it becomes a job. I admire people who like to work. I try not to write with a style. I just write the way I write and hope that someone else will find it interesting and entertaining. It just came to me and it really works (I think). A year after writing Scarlet Ambrosia, I see the story through a different pair of eyes. At the core of the novel is a young man’s struggle with the forces of good and evil within himself and the world around him. The vampire archetype, I now realize, is a metaphor for my heart’s dream to realize its divine nature. The supernatural powers and ramped up energy level Devon acquires as a vampire make him half-human and half-god, something like the mythological Greek gods. He can choose to use his new powers for good or evil purposes. I believe everyone has the potential to become a divinely human being. I’ve been a spiritual seeker for most of my adult life. Awakening isn’t easy, but I’ve found it’s worth the effort. What happens for Devon is happening for me in a much subtler way without the super-human powers, but happily, minus the need to drink human blood. I think we have to be careful with the word “realistic” when we’re talking about a novel with paranormal romance thriller tendencies. I always try to create fictional worlds that work logically if the reader accepts the genre conventions. I build my characters with relatable motives, desires, and character traits. Then the story has to evolve believably and the characters have to behave consistently with their basic traits as they grow and eventually make decisions and act in ways that surprise us, but at the same time, we can see where those actions and decisions came from. I hope this is not too much information. Siddhartha, by Herman Hesse, had a powerful effect on me when I first read it in my late teens. I’ve recently read a series of book on spiritual awakening by Saniel Bonder that have inspired me to open up to a higher purpose. I’d say Douglas Adams (The Hitchhiker’s Guide to the Galaxy) although I don’t write in his style. His remarkable imagination and sense of humor inspire me. I’ve just discovered a fine new thriller writer by the name of Jeff Abbott. His books are hard to put down and very good for the long plane rides. I’m working on an outline for a sequel to Scarlet Ambrosia and I’m exploring a new idea for a science fiction novel as I mentioned above. 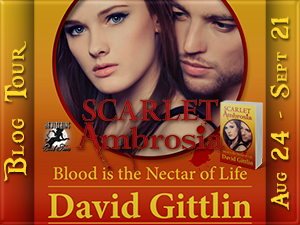 The book trailer for Scarlet Ambrosia is fun and interesting. This entry was posted on August 24, 2015, 4:32 pm and is filed under Book Marketing, eBook Marketing, fiction, humor, Interviews, Novels, Online Marketing, Self-Publishing. You can follow any responses to this entry through RSS 2.0. You can leave a response, or trackback from your own site.